Each painter will leave with their own interpretation of the above picture! This year for the CJ's Journey Art Event we will be 'Painting with a Twist' in Creve Coeur, St. Louis! With paint and brushes in hand we will enjoy a class, Saturday, September 15th, on how to paint. Alcoholic beverages will be provided, as well as appetizers. We expect this event to be a very fun experience and hope that you and your friends can make it out for a good time to support a great cause. Each painter leaves with their very own masterpiece. 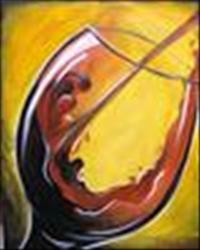 Painters Registration ($50) includes cocktails, appetizers and 3 hours of painting. At the end of the event you walk away with your very own masterpiece. Non-Painters Registration ($25) includes cocktails, appetizers and a good time. If you would like to register online for this event, please follow the link below.